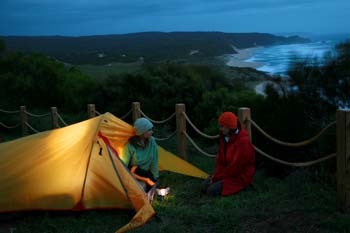 Spend three wonderful nights in some great camping spots on the Great Ocean Walk! We'll transfer your camping gear, food, bags & provide drinking water (no drinking water available on the track). You finish at Ryan's Den Management Track on day four. We return you back to Apollo Bay. Your rucksacks / luggage as close to the campsites as possible. Please read the itinerary below for instruction details on each day's walk. Food. You purchase your food before you arrive, or in Apollo Bay on your arrival. Apollo Bay has 2 supermarkets and a fruit & vegetable store. On the first day of your walk, you leave your food (for the duration of your whole walk) in our trailer. There are no shops on the walk. Drinking water. There is no drinking water available on the track, so we leave large containers of drinking water in the trailer for you to access. You bring smaller 1-2 litre bottles to re-fill as required. Starts on selected Mondays (and Wednesdays in high season). This camping itinerary may not be available every week so please check our advertised dates before you book your sites. 1) Check that there is availability for this package first by checking dates on our booking button. 2) Book Your Campsites with Parks Victoria (click here for more info). The price of the campsites are not included (they are approx $30 per night for a 1, 2 or 3 man tent on one site). If there is no availability for the Great Ocean Walk 'hike in' site, book a spot at the group area site. 3) Book with us.Whilst booking select an official map, lighthouse tickets, EPIRB (emergency positioning device), poles or camping gear to your shopping basket if required. Day 1 - (22km) Apollo Bay to Blanket Bay. Please note there is no walk briefing for this walk so you need to bring our walk notes with you, which we will email you on booking. In the morning at approx 8.30am you leave your gear in the trailer in the car park in Pascoe Street, next to the Bendigo Bank and opposite the Eco YHA. On your arrival in Apollo Bay you text us / call on 0405 495 909. We provide you key code for the trailer and leave any extras in the trailer you may have booked with us (i.e. map/ eprib / poles or camping gear).You walk to Blanket Bay from Apollo Bay. We leave the trailer at Blanket Bay car park at approx 3.30pm. Camp: You book the 'hike in' campsite at Blanket Bay (or book the group area campsite at Blanket Bay if the 'hike in' site is full). Day 2 - (21km) Walk Blanket Bay to Aire River. You lock your large rucksacks for collection (by 9 am) in the trailer at Blanket Bay. You walk to Aire River. You collect your rucksacks from the trailer at Aire River in the afternoon. Camp: You book the 'hike in' campsite at Aire River (or book the group area campsite at Aire River if the 'hike in' site is full). Day 3 - (14km) Aire River to Johanna Beach. Leave large rucksacks for collection (by 9 am) in the trailer at Aire River. You walk to Johanna Beach. You collect rucksacks from the trailer at Johanna Beach in the afternoon. Camp: You book the 'hike in' campsite at Johanna Beach (or book the group area campsite at Johanna Beach if the 'hike in' site is full). Day 4 - (14km) Johanna Beach to Ryan's Den. Leave large rucksacks for collection (by 8am) in the trailer at Johanna Beach. You walk from Johanna Beach to Ryan's Den Management Track. We meet you at Ryan's Den Management Track at strictly 2.45pm. (PLEASE REFER TO THE WALK NOTES PROVIDED FOR MORE DETAILS REGARDING THE MEETING SPOT). We drive you back into Apollo Bay by approx 4pm. Walk notes are included. These will be provided by a link when your booking is confirmed. Please PRINT them off and bring them with you. We strongly suggest you buy an Official Great Ocean Walk Map if you have not already purchased one. You are able to buy a map from GOR Shuttle at an additional cost for $15 and you collect on arrival. (This price does not include postage). We recommend that you prepare/ train for the walk (it can be difficult if you are not fit). Please wear appropriate clothing, comfortable walking shoes or boots and bring a couple of 1, 2 or 3 litre refillable water bottles. Please only bring a lightweight one or two man tent, or maximum a small three man tent. Mobile phone connection: Telstra sim cards offer the best reception on the walk. Note that several sections of the walk do not have phone reception, or it is extremely patchy. Please also note that if you arrive early on your last day at the pick up point you must wait for your pick up / transfer as times advertised. If you are fast walkers, pace your last day's walk. Enjoy your campsite in the morning before you set off on your walk to avoid waiting times. IMPORTANT NOTE: Please ensure that you book for the correct amount of people. We will not have enough seats on the bus, for you to return to Apollo Bay at the end of the walk if you have not booked for the correct number of walkers. CHILDREN: Please note all children require their own seats (by law cannot sit on laps) & child 'insert' seats must be provided by the customer where Australian laws apply. We do not provide child seats. Please contact us if you wish to book small children/ infants onto this trip. 1 x Trangia & 1 x one litre bottle of fuel, basic lightweight plates, cups, bowls/cooking utensils $45. (Please note that if you need extra fuel this is charged at an additional cost). Emergency Position-Indicating Radio Beacon (EPIRB) - to deploy in emergencies only so that emergency services can track your position.Please note that this epirb is worth approx $300. If you fail to return this epirb at the end of your walk you will be charged $300 to your visa card. All items are returned to us at the conclusion of your walk. If you wish to hire any of these items please add them to your shopping basket when booking.